through my fingers and creates a work of art. It is satisfying to watch my rugs come alive as I work up the image. Most of my images come from my everyday world in Woody Point: clothes blowing on a wash line, fish being caught by the local fishermen or the beauty of nature's colours as they change with the seasons." Located in the heart of Gros Morne National Park, the historic town and natural beauty of Woody Point provides endless inspiration for Molly White's hooked rugs and fibre art. Diverse scenes such as a dory bobbing on the endless ocean or a field of white and yellow daisies blinking in the sunlight quietly grace her hooked rugs. White's work is noted for its meticulous hooking that captures life-like details and has earned her commissions and exhibitions. 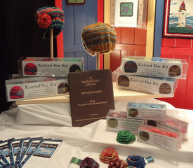 Along with the recycled clothes or stockings traditionally associated with Newfoundland rugs, Molly hooks with 100% wool yarn that she hand dyes to produce a palette of subtle and unique colours and other non traditional materials such as ribbon, fleece or novelty yarn.